Streak is around a year old and is a pitbull terrier mix who was found as a stray and never claimed and came to rescue to find her forever home. Streak is very responsive to her people and wants to be near. 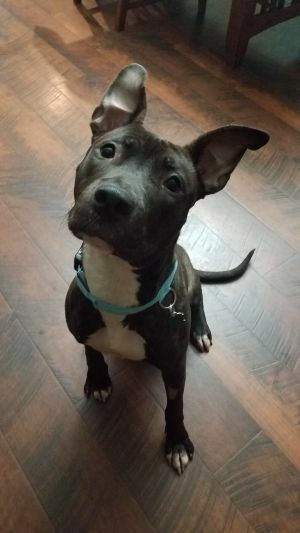 She is good with other dogs, and wants to play - she is getting some additional socialization in her foster home to keep tuning up her manners on doggie interactions. Streak is kenneled during the day when her foster is gone and is doing well on crate training - she sometimes will bark and make some noise initially, but does quiet down after a bit. Streak is not good with cats and recommended with kids age 8 and over who are used to being around dogs. Streak has some prey drive (birds, squirrels, rabbits) and would do best in a fenced in yard where she can run and play safely. For that reason, she would also be recommended to be around dogs more of her own size or larger. Streak is food motivated and wants to learn! This dog will be at our adoption event at the Woodbury PetSmart on Saturday from 11-2 looking for a home!